Established in 1959, Taiwan, this airline is one of the leading ones in China. With over fifty years of service, and sixty-six operating aircrafts, China airlines flies to eighty-nine destinations worldwide, including cargo. Domestic flights of the airline include: Taipei, Taichung, and Kaohsiung. Flights into mainland China and Asia include: Tokyo, Fukuoka, Nagoya, Hiroshima, Okinawa, Miyazaki, Hong Kong, Bangkok, Phuket, Jakarta, Kalibo,Denpasar, Surabaya, Hanoi, Ho Chi Minh City, Yongon, Laoag, Kuala Lumpur, Penang, Singapore, Phnom Penh, New Delhi , Manila, Seoul, Cheju, Chiang Mai, Osaka, Sapporo, Beijing, Shanghai, Guangzhou, Nanjing, Hangzhou, Shenzhen, Chengdu, Xian, Zhengzhou and numerous others. Extending further into Europe, China airlines also has flights to the following major European cities: Amsterdam, Frankfurt, Rome, London , Vienna, Hamburg, Hanover, Stuttgart , Düsseldorf , Cologne , Nuremberg , Munich, etc. Furthermore, overseas flights into Oceania and North America include, and are not limited to: Sydney, Brisbane, Guam, Palau, Anchorage, Honolulu, Los Angeles, New York, San Francisco, Vancouver, Boston, Cincinnati, Salt Lake City, Orlando, Fort Lauderdale, Tampa, Hartford, Columbus, Raleigh/Durham, Jacksonville, etc. 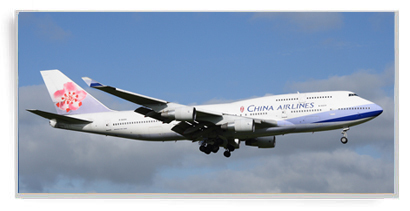 China airlines also consolidate with other major airlines such as: Alitalia, Chech Airlines, Delta Airlines, Korean Air, Westjet within Canada, and many others. The airline employees over ten thousand staff members, and offers three classes of service on most flights, including: first, dynasty, and economy class. The airline provides an in flight entertainment system, Fantasy Sky, available in English, Japanese, and Mandarin. It provides movies, news, songs, and video games. Passengers can enjoy Dynasty, the in flight magazine as well as duty free shopping. In flight refreshments, snacks, and meals are also included for all classes of service, if the flight period exceeds three hours. Should the flight time be less than three hours, refreshments such as tea, coffee, and water are served to economy class. First and dynasty class are provided but not limited to these refreshments. First and dynasty class passengers are allowed two carry on items, while economy class passengers may carry on one personal item. The airline also caters to special needs for all classes of service which include: wheelchair requests, special meals, expecting mothers, passengers with infants, etc. In addition to passenger jets, China airlines fly cargo worldwide to destinations such as: Milan, Luxembourg, Manchester, Prague, Stockholm, Abu Dhabi, Chicago, Dallas, Miami, Seattle, Houston, and Atlanta. Cargo can conveniently be tracked on-line at any time, and is secured by a customer log-in and password.